Asturix is a GNU/Linux distribution that’s based on Ubuntu. It comes with proprietary codecs installed (VLC is the multimedia player alongside with Clementine), LibreOffice, GIMP, Shotwell, Chromium web browser, Deja-Dup backup utility etc … So in a nutshell, almost all the software applications that you get with Ubuntu 11.10 Oneiric Ocelot (and a few additional ones such as GIMP, VLC etc) are included in the default ISO disk image. There’s nothing new about it in that sense as almost all the Ubuntu based distros have all those “features” by default. But what’s interesting about Asturix distribution is that unlike most others, it comes with a desktop environment of its own called “Asturix On”. I even mistook it for Gnome Shell because they look a hell lot similar in many ways :). Anyhow, “Asturix On” is a desktop that emphasizes on simplicity (very close to Gnome project) and usability. The desktop is written (coded) by using web “friendly” programming languages such as HTML5, CSS, Java and the UI (user interface) is built using the Qt tool-kit. According to the developer, they’ve designed the desktop to be quite “compatible” with touch screen based devices such as Tablets as well. So in the review I’ll actually try to focus on the desktop rather than the individual software etc. Now like most others I too have used a lot of major and somewhat, complete desktop environments such as KDE, Gnome, LXDE, XFCE, Unity etc but I’m really impressed by the fast and system resources friendly nature of “Asturix On” desktop. Just like with Unity or Gnome Shell, “Asturix On” too has two desktop versions. The default one is called “On” and the other is called “Asturix Lite” (you can switch between them in the log-in window). And as the name denotes, the latter is specifically designed to run under “older” hardware thus it is slightly faster than the default “On”. But the rest assured, they both run really fast!. The “On” desktop uses Compiz as the composting window manager and in comparison with Unity 3D, I think Austrix On and Lite editions work really well with Compiz as I have an old laptop and can easily detect the speed difference. I’m pretty sure that they’ve done other optimizations too because when I first logged into the desktop the memory usage was somewhat low as well. If your hardware is not capable of running under with Compiz, then Asturix On will run using the Openbox (a lightweight, 2d window manager). Well, when you first load the desktop, you’re greeted with two panels at the top and a side-bar to your left (bit similar to Unity’s Application Launcher) and the middle section of the screen is reserved for showing a list of installed apps and their icons (like in Unity’s Dash). The first panel located on top of the screen which is a bit of a Gnome Classic type top panel (a bit similar to the one in Unity too). Now the behavior of this panel is also very similar to the Gnome Classic panels, as whenever we open something, we can minimize our apps to it. To your right-corner you’ll see a user switching section, system menu to next to it, a Clock, Online accounts manage icon, the volume icon (with running audio application indication support), a network icon etc. So as you can see, it also represents a lot of Unity’s top panel as well. On the left-corner, you’ll see a start-menu type icon like in Windows, but once you click on it, it minimizes all the opened applications to the top panel (“show desktop” type behavior) rather than opening up a menu. Then below that there’s another panel with a search box. This is a bit similar to Unity’s Dash, because whenever you want to find an installed application you can search on that box. By default it shows a list of all the installed applications thus your whole screen (at least most of it) is consumed by those icons which I find to be a bit of an pain in the as*, sometimes. But as a quick & dirty fix ;-), you can type a weird text in the search box as it should clear out the whole screen and won’t change until you re-type something. Anyway when comparing with Unity’s Dash, Asturix On locates and finds applications extremely fast. But then I though that could be because the developers have included a pre-indexed database of the default installed apps thus making the search & locate faster. Just to check it, I quickly installed Synaptic package manager and as soon as Asturix installed it I searched for it in the “search box” and it located it almost immediately!. So comparing with Unity Dash, although this is not as rich in features as it is but considering searching and finding applications, Asturix On does an excellent job. Other than locating your applications, you can click on the “Places & Recent files” button to quickly access your most recent content etc. And if you don’t like the Blue theme/color of the second Panel, you can click on that little “gears” icon and change between few built in themes (it only change the color of the bar actually). To your left you have another major part of Asturix On desktop. 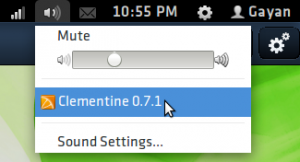 It’s a small sidebar which lets you quickly launch few apps (Chromium, LibreOffice, VLC, Ubuntu Software Center and Shutdown/Restart button). And unless you maximize a window, this side-bar is always visible and right now you cannot change anything (change size, color etc …). You can easily add/remove apps into it. When you want to remove an icon, just move your mouse on top it (on the sidebar of course) and simply right-click. If you want to add a new one, then search and find it, when done right-click on it and that should add it to the sidebar. What about the desktop background changing, creating a folder etc ?? Well that’s thing. With Asturix On, there isn’t any manageable desktop so to speak. For instance, like in Gnome or Unity, with “On” there is no desktop where you can right-click and create a document, link, folder. 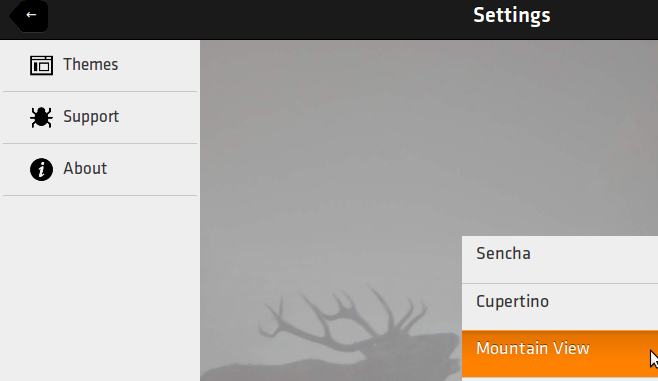 What you have for a desktop is the top panel, second panel with application window and the sidebar. That’s it!. All your personal file creations has to be carried out outside of the desktop (in Home or any other location). Although I’m not extremely fond of it yet then again the desktop is designed in a way to minimize the need of an “old school desktop”. For instance, rather than looking at the desktop and finding an application shortcut, you can locate the app easily (that actually depends, say that you’re a touch typist, then you’ll love it. But for other users they might not enjoy it that much). 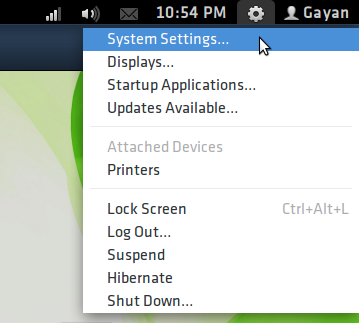 But even though we cannot change things like that as in a conventional desktop, still you can use the “Appearance” window and change the background plus the window themes (uses the Gnome Shell theme called Adwaita) as well. Now I haven’t tried, but I think you can install something like the “Gnome-Tweak-Tool” and install themes easily. And as said before, I’m not going to talk about individual apps as there’s nothing new to talk about. But since this is based on Ubuntu 11.10 Oneiric Ocelot, all the software resources are available for download just like in Ubuntu!. 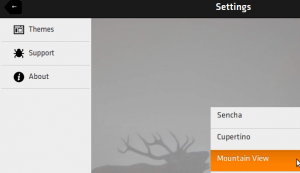 You can either use the Ubuntu Software Center (yikes!) or can just “sudo apt-get install … ” the heck out of anything, as long as it’s in the Ubuntu repositories :). Well there are few actually. And most of them are due to my ATI (old) and Compiz (windows wouldn’t update things efficiently: for instance, this onetime I went to Asturix home page and then click on my other tab which had HecticGeek home page. But under the URL, Chromium still displayed the Asturix URL instead of HecticGeek). But a simple minimize to the top panel and then maximizing Chromium solved it, so it was the composition window manager rather than the app or Asturix On, I think. So I won’t blame the distribution/desktop for those. Although it can locate your installed applications and most recently viewed files really fast, still we cannot use that search-box to search for local files. Of course it comes with the search tool included with Gnome Shell (and Nautilus) but it would’ve been really nice if we could just search for local files by default. Another thing that worries me is the lack of proper documentation. For instance, when I lost those icons on the sidebar (accidentally right clicked on it :D), at first I thought it was some sort of a bug. And I accidentally discovered that adding and removing files can be done by using the mouse right click button. And even though there’s a WiKi page which has some info about the installation but the lack of desktop related documentation is a big drawback. Especially mentioning that this is a new desktop that is slightly different. While using applications in the windowed mode (rather than running in full screen) you can always see the icons of installed apps in the background which can be a bit distracting. So it would’ve been better if we could disable those icons visibility manually. But when you’re running in the full screen mode, no distractions, just excellent :). And unlike with Unity or other desktops, there isn’t a way to switch between opened windows using a keyboard shortcut such as “Alt + Tab”. But then again thanks to the top panel and its ability to dock apps in the classical way, I didn’t find it to be that much of an issue either. These are the ones that come to my mind right now but as the time goes on I’ll slowly update this post if encounters any issues :). So, it’s sort of a perfect desktop then huh? Well, I don’t know about that as it’s just a matter of preferences. But in my humble opinion the “Asturix On” desktop (including the “Lite” edition), although it’s relatively extremely new but while I was testing it I never encountered any issues! (other than that Compiz related things which are pretty normal for my Laptop). Although then again, Asturix On uses a lot of old and durable Gnome apps, other well known tools, Compiz etc rather than doing all the work by itself, which should have helped massively to stay stable. But nonetheless, for a newcomer, it was really stable while I was using it (even writing this post on it). So, if you’re looking for a desktop with really impressive responsive times (again I’m comparing my experience with Unity with my old Laptop), stable and extremely simple (yet productive) UI which is a bit of a mix of Unity, Gnome Shell and the Classic Gnome desktops, then I think Asturix On is a pretty decent choice. And as the time goes on, if they can add more features (more customization features etc) , it can be a pretty competitive desktop in my opinion. However, it won’t include an old-school desktop with folders and documents all over it etc as mentioned, thus if you’re looking for something that has all that, then you might be disappointed. Ubuntu 11.10 Oneiric Ocelot users don’t have to download the ISO as they’ve given a PPA so you can just issue few commands and the Asturix On should be installed within minutes!. However, the PPA does not seems to be updated with the latest version and it didn’t work in my Ubuntu 11.10 (tried it few hours ago). So if you think the downloading and burning to an optical media or a USB is a bit of a stretch, then perhaps they’ll provide an updated packages within the next few days (hopefully) so you’d better wait few days. If interested, you can get more information from this Asturix OS home page and this Asturix On desktop page (including the install instruction on Ubuntu etc). Good luck. Special note: In my old blog, I’ve had few complaints saying that there are few grammatical errors in my writing style and the way I use English is somewhat weird and hard to understand. I’m doing my best to minimize those (always read the article at least twice before publishing) issues my apologies to all, after all I am a bit Hectic ;-). I'm using Asturix 4 for past few weeks..one thing i have to say is it is a awesome distro ;I'm just impressed by its speed..really blazing fast..! From their forum they say that they will provide an update soon..little changes in On shell..
And yes I'm with you concerning its speed as well. It'll be interesting what the update would bring then (few more customizations perhaps), can't wait till it comes ;-). 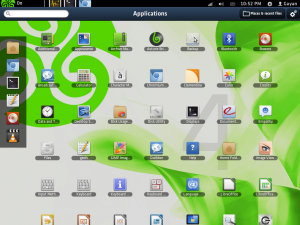 It is an interesting distro, I have installed it in my desktop. On login, it still has a "Guest" login, which is generally disabled on installation. The forum is still in a nascent stage, so I thought I would post this here. Again, I cannot be certain of this as I had to remove it and install Ubuntu since I install apps and write reviews based on Ubuntu primarily. But when my new Dell Vostro v131 arrives, I'm certainly gonna re-install it! ;-). Thanks for the suggestion though. Good luck. The below method described in AskUbuntu community might help if you wanna disable it. I have been using asturix4 for few weeks now and I'm very impressed by its simplicity ease of use and the fact that it comes with all the codecs I need installed. There are of course a few niggles but these hopefully will be addressed in good time. The forum is a good place to go to get any problems addressed. I agree. As you can see with the above comment (by "abirokz"), they're actually planing few updates to the desktop (such as the ability to hide icons on the desktop etc). Interesting times ahead, lol :D.